This is the independent transport videos second visit to the historic city of Oxford to record the bus operations of several operators for you to enjoy. On this programme we visit Oxford twice, the first in June, the second in November. The main operator is Go-Ahead owned ‘Oxford Bus Company’ in a two-tone red livery, but with some buses branded for the Brookes University as ‘Brookesbus’ in either a blue, red or grey (as seen on our second visit) based livery complete with decals for the service. The Park & Ride vehicles are in a smart two-tone green livery. The other major operator is Stagecoach. Here vehicles are presented in the standard Stagecoach livery or a green based livery for the hybrid vehicles and buses in the smart gold and dark blue livery for the “Stagecoach Gold” branded services are also seen. We also see buses from Arriva in both their standard livery and in “Sappire” livery on the 280 service. Added to this there are buses from “Thames Travel”, “Heyfordian” and of course the coaches from the London and Airport services, the “Oxford Tube” and the X90/190 group of services. Look out for the all over dark red Enviro 400s on our June visit as these buses were ordered by Go-Ahead South Coast for their “Salisbury Reds” fleet, these buses left the Oxford fleet some weeks after filming. You will also see further Enviro 400s in the Southern Vectis two-tone green livery, which are on loan to the Oxford Bus Company from Go-Ahead South Coast for a railway contract. On both visits our filming takes place in and around Oxford city centre. In June the students are leaving for the summer holidays with a number of graduation celebrations taking place. Some of the locations visited are St Aldate’s, High Street, Queen Street, New Road, Park End Street, the Railway Station and The Plain. There is plenty of action and variety for you to see. On our November visit we see the newly introduced Enviro 400s with the new design of bodywork and Euro 6 engines which will be mandatory in Oxford as it has become a LEZ (Low Emission Zone) city. There are 20 of these smart new double deckers all in the grey Brookes University livery. To conclude our programme we present some archive video from the camera of transport photographer Malcolm King. Filmed in 1990 at The Plain and the city centre we see poppy red and white Oxford buses in the shape of Bristol VRs, Leyland Olympians, the final Northern Counties bodied Daimler Fleetline and Bristol VRT 476 (HUD 476S) in traditional Oxford livery (now preserved at the Oxford Bus Museum) fighting with the “Nipper” and “Thames Transit” minibuses. 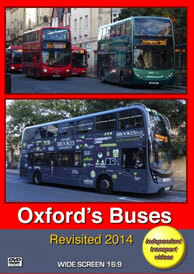 We also see early Oxford Tube coaches in competition with the Oxford City Link coaches and much more – Enjoy!